Visman’s compound water cyclone (CWC) was invented by Jan Visman of Alberta and patented in 1965 (US #3,353,673) and reissued in 1967 (US Re#26,720). Research on the ability of compound water cyclones to recover placer gold began in the Yukon in the 1970s and continued in the 1980s in British Columbia and Alaska [11,56,72,73].CWCs were developed to maximise concentration by particle density. They are of squat shape due to their wide-angled cones, and internally have long ‘vortexfinders.’ CWCs are potentially excellent gold recovery devices by virtue of low cost, ease of operation, and nomoving parts. Instead it uses the energy of pump edin flowing slurry ‘guided’ by the internal shape of the device to achieve centrifugal concentration. Feed is passed through a fine mesh screen (e.g. 1-3mm), then pumped as slurry into a CWC at a controlledrate. 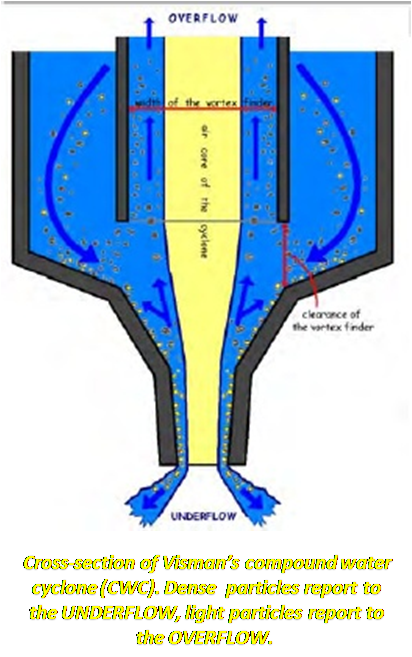 The slurry pressure induces the slurry to slam against the internal wall of the cyclone, and spin vigorously while subjected to high g forces (e.g. 40-50 g). A gold particle’s residence time in a CWC is a mere second  before being ejected in the under flow. It is unclear how separation is achieved so rapidly. The densest particles, fine and coarse, are continuously discharged as concentrate from the base of the CWC with the under flow.The lightest particles are continuously discharged from the top of the CWC with the overflow. Unfortunately the Alaska tests did not produce a high concentration ratio, and therefore the compound water cyclone can be inserted into a wash-plant as a useful but non-essential stage, rather than replacing say a sluice, jig or centrifuge. Results of tests are variable, and it is concluded by the author that as yet – in spite of considerable research –the theoretical basis for CWC is not firmly established andthis is an impediment to developing a device thatconsistently produces good results in terms of fine goldrecovery and concentration ratio. Lemmon’s vanner was invented by Norvel Lemmonsof Arkansas and patented in 1989 (US #4,826,018). Testson Liard River placers in the Yukon achieved recoveries “consistently above 95% and some approached 99%” for placer gold of 20-250 μ. However it is unclear if Lemmons’ vanner was commercialised, but it merits further study. Experiments to recover placer gold with other typesof vanner were made in Alaska  and elsewhere butnone were successfully commercialised. Meritinginvestigation is that gold particles grip tenaciously to certain synthetic surfaces due to electrostatic charges. A gently inclined endless belt can recover gold. If the belt is driven up slope and slurry poured on it, then the slurry will flow down the belt to topple off as tailings over the end roller. Mean while dense particles such as gold will cling to the belt by friction and be hauled with the belt to the top roller where they topple into a concentrate bin. 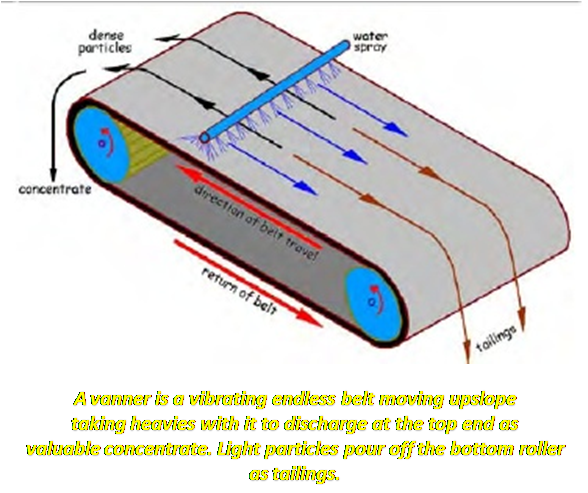 Vanners are a simple but marked improvement, by introducing some gentle vibration to the slowly moving belt and this generally enhances gold recovery. A good example of the operation of a vanner in recovering placer gold is of the home-made belt concentrator devised by C.W. Ammen .The device is “a smooth rubber belt moving uphill at a rather slow pace.” The belt is of extremely smooth white rubber belting from a food machinery manufacturer. The unit has a hand-held water hose allowing the operator to vary the water pressure, volume and direction. The belt is driven by a gear-reducer motor with an auto transformer, giving a range of speeds. Strictly speaking, to be classedas a vanner then belt should be vibrating but it is unclear if the motor vibrates the belt significantly or not. As the belt travels upward, the material “…is sifted onto the belt about midway between top and bottom. At this point, a fine water spray is played on the belt, so that you have a down ward flow of water as the material moves upward. The gangue washes down while the gold particles stick to the belt with great tenacity – especially when the gold appears in the form of flat particles (platelets)”. This comment is intriguing as it suggests that Ammen’s beltmay be more disposed to recover flat gold than is possible with most other devices. Ammen’s belt proved was effective in recovering “99.99%” of “fine gold” that was put as tracer in sand fedto the device.